Over the course of 2014, FUND Consulting worked on seven strategic plans with CDFI loan funds and banks. All of the final strategic plans included a goal that was tied to fundraising and / or increasing Board involvement in fundraising efforts. This led FUND to speculate on the current role that CDFI Boards are playing in terms of raising funds. To answer this question, FUND Consulting conducted a research project that included a survey of staff at CDFIs nationwide. Over the next eight weeks, our blog will be dedicated to highlighting the results of our research, and the implications that the data might have on CDFI management. Most non-profit Boards struggle with fundraising. This topic ranks #1 among board areas needing improvement, and has been so for many years in BoardSource’s regular Nonprofit Governance Index. However the general perception among CDFI industry professionals is that the situation might be even more challenging with respect to CDFI Boards. The purpose of our research project was to assess the current state of the work that CDFI Boards are doing with respect to fundraising. The survey results are based on the responses of 168 CDFIs (and a handful of CDFIs in the Certification process) representing approximately 20% of all CDFIs. Overall, the responses indicated that the CDFI industry has room for growth in engaging board members to take an active role in fundraising. Thirty-seven percent of survey respondents representing loan funds indicated that their Boards raise money for the CDFI. This number is lower for CDFI Bank and Credit Union respondents, with 13% for CDFI Banks and 10% of CDFI Credit Union board members participating in fundraising. 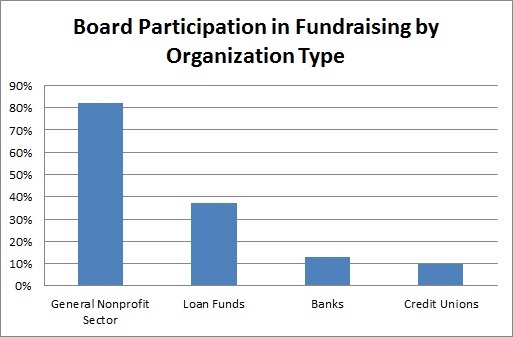 In comparison, in a 2012 report by the Nonprofit Research Collaborative, 83% of nonprofits indicated that their Boards participated directly in fundraising. Does your board actively participate in fundraising? Why or why not? Next week, the blog will be dedicated to presenting data on CDFI board composition. We will facilitate a discussion on board recruitment and how to build a board that helps increase resources for a CDFI while maintaining board accountability to the community. Getting Ready for CRA Examinations with the Performance Context	CDFI Boards and Fundraising: Week 2, What do CDFI Boards Look Like?